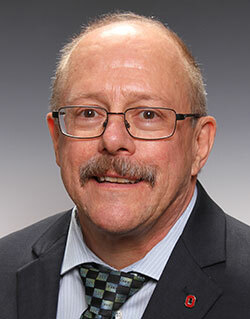 Dr. John Bartlett, the College of Dentistry's Associate Dean for Research and the George C. Paffenbarger Alumni-Endowed Chair in Dental Research, recently was awarded a $2.7M grant from the National Institutes of Health (NIH) National Institute of Dental and Craniofacial Research. The five-year award supports a project titled "Enamelysin Processing Mechanisms in Amelogenesis." This research is aimed at defining how enamelysin, a tooth-specific matrix metalloproteinase (MMP20), processes so that enamel will bind tightly to the underlying dentin. The project will also focus on determining how such processing allows for proper enamel development. An internationally recognized researcher in dental enamel development and the gene expression program that is required to form teeth, Dr. Bartlett's work has been recognized with a number of prestigious awards. He was honored in 2012 with the Distinguished Scientist Award in Basic Research in Biological Mineralization from the International Association for Dental Research (IADR). And in 2018, he was honored with his second Distinguished Scientist Award for Pharmacology, Therapeutics, and Toxicology Research that "contributes to the understanding of the mechanisms, efficacy, and safety of drugs used to treat dental disease and associated symptoms."